Pakistan Auto Industry is getting exciting and competitive in recent times. Big companies Suzuki, Honda and Toyota introduced many new model vehicles and also improve their existing fleets. In the beginning of 2017, Honda and Suzuki introduced new models and upgraded their existing vehicles. Now Toyota is also getting ready to introduce the New facelift model of Corolla, the most popular sedan car in local Pakistan market. So far company has not announced any date regarding the launch of Toyota Corolla Facelift 2017 yet the rumors are that it will be launched in mid of year. Although noting is confirmed about the upcoming changes in New Corolla 2017 yet we are providing you the expected changes based upon different sources. Firstly New Corolla 2017 will have completely new front bumper along with new front grill and new shape front headlights. This change is for sure and you can see the changed bumper in the picture given here. This is the most important and also most impressive change as it will give sporty looks to the new Corolla. 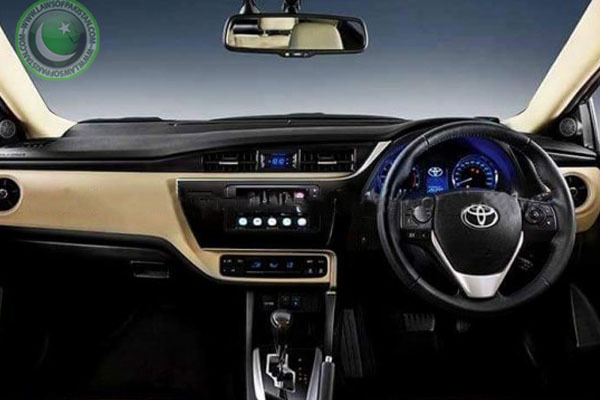 Further Indus Motor is making lot of changes in the interior and features of New Corolla. The new car will come with two airbags which is one important safety feature. There will be force limiter and pretension for driver and passenger. They are also providing new LED clearance lamps in new car. Further the minor changes in the interior dashboard are also on the table. There will be more minor cosmetic changes in the exterior of this car. Overall New Toyota Corolla 2017 facelift will be much better than its predecessor. Honda City also made some changes and introduced new Honda City 2017 but these changes are really pathetic and almost negligible but there are expectations that Toyota will make its customers more satisfied and happy. 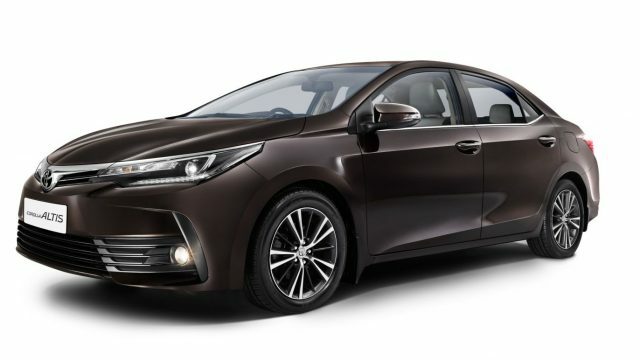 So the wait is over and Toyota Pakistan is ready to introduce new facelifted 11th generation Corolla with many cosmetic changes and attractive new features. New Toyota Corolla Facelift 2018 will be more attractive and stylish design. It has upgraded front as well as new stylish rear. Followings are some new and prominent features which are included in new Toyota Corolla 2018. On the front there are LED daytime running lights and BI Beam LED headlights. These new lights are nestled between a much slimmer front grille and front bumber. 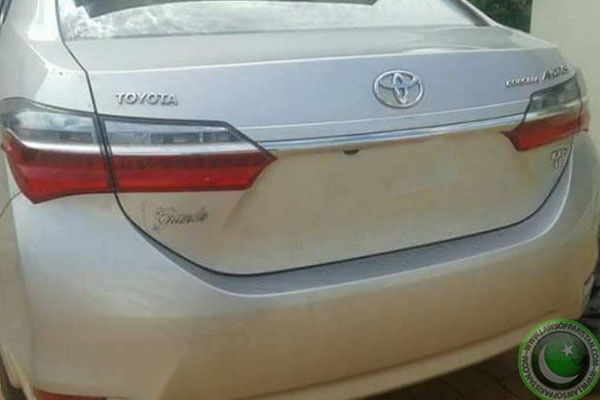 Rear-side of New Corolla facelifted will come with updated and new taillights which gives it more modern and stylish look. In new Toyota Corolla facelifted 2018 there will be “Auto Reverse Link Mode System”. The system helps driver while in reverse gear. When driver shifts into reverse gear the system automatically engage the back camera along with side mirrors and provide better view of surroundings for driver. The new facelifted model will come with “Toyota’s Latest Smart Key System”. This latest system allows you to automatically open the door while putting your hand on the handle if you have key fob with you. The new model will come with 16-inch alloy wheels with YOKOHAMA Tyres. This feature will come with high-end variant i.e. 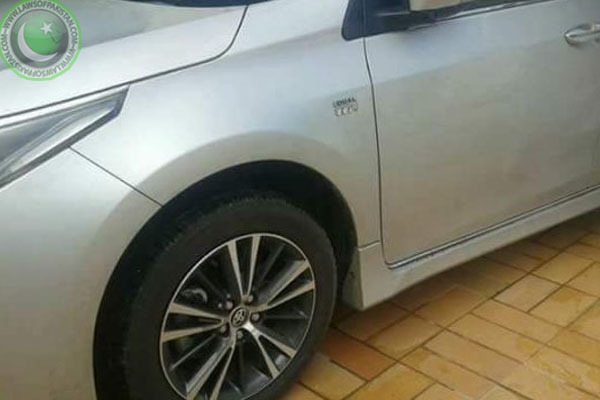 Toyota Corolla Grande 2018. There will be new side skirts. New Auto retractable side view mirrors. Followings are some prominent I interior features in this new car. There will be updated push button start system in this new Toyota Corolla facelifte Pakistan 2018. Immobilizer and vehicle stability control. 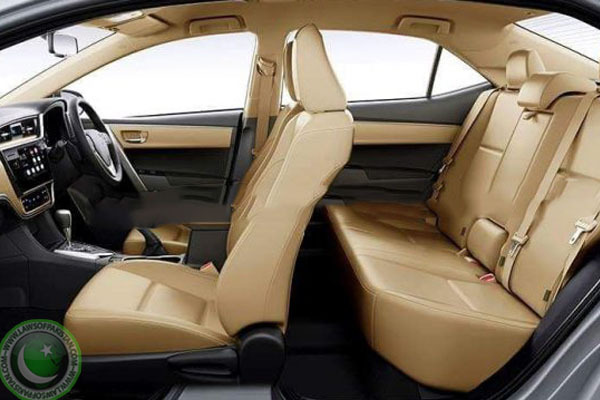 First of all facelifted Altis Grande will come with brand new Flaxen interior with updated infotainment system along with 9-inch LED. It will be equipped with front and rare camera. There will be Wi-Fi hotspot features. New seat belts with pretensions & Force limiters along with child seat anchors. No need to worry about charging your phone in this new car as it comes with front and rear USB slots for charging and other usages. There will be new Optitron instrument cluster with colored LED lights which not only provides attractive look but pose less strain on the eyes for driver. 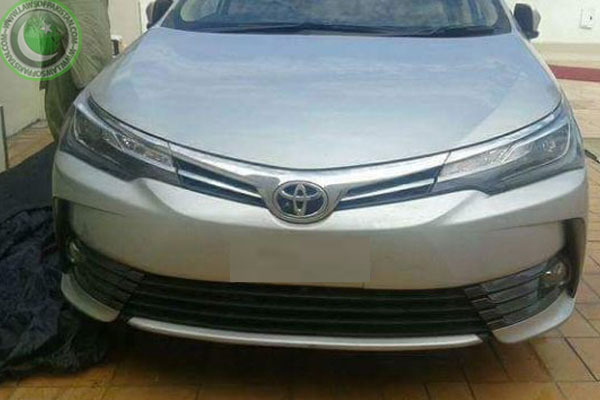 Overall this New Toyota Corolla facelift 2018 will be launched soon and we will update its exact date of launch as soon as we officially confirm it so keep in touch with us to get more updates regarding this most successful sedan car in Pakistan. In the following table you can read about the old and new prices of this new facelift car. Note: Keep in touch with us we will provide more details about that upcoming new model as soon as we receive them. NICE CAR,WHEN IT WILL COME.